I’ve just come back from a week at the beach. Lucky me eh? Well, it wasn’t all work and no play. When you work for yourself, vacations always involve a little bit of “work” so my days of hopping on a jet with merely my toothbrush and overnight bag in hand are long gone! 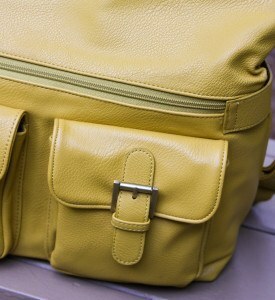 So you can image my delight when the kind people at Aide de Camp sent me the beautiful Nadine camera bag to review. They were adamant that I gave it a thorough testing and let me tell you, I jumped at the chance to give it a work out! 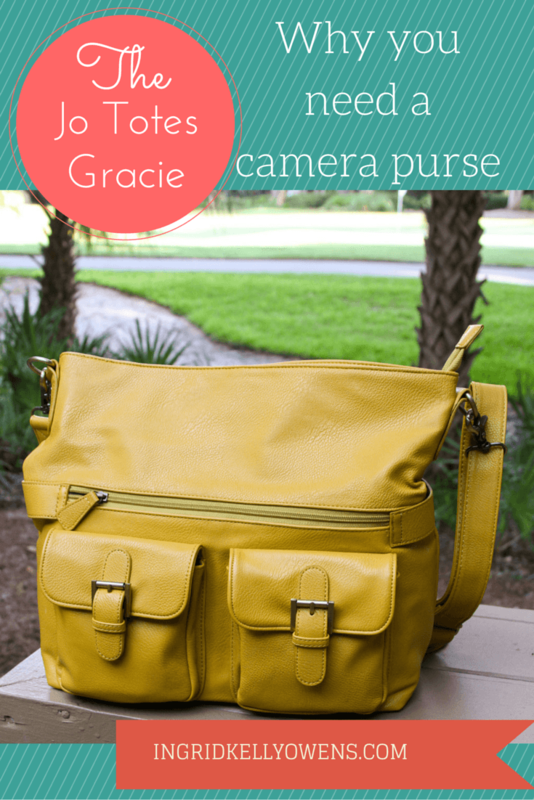 The Nadine bag is much bigger than my previous camera bags – yes – I’ve had a few! This is because not only does that Nadine comfortably fit my Canon 7D + additional lens and speedlight, it can also accommodate my laptop. And friends, my laptop is not one of these svelte wafer thin things, but a very desperate-for-an-upgrade MacBook 15″ dinosaur. And it all fit in the Nadine bag! PLUS I even had room for my external hard drive that I felt necessary to take as a back up due to the age of my computer – did I mention I need an upgrade? Make no mistake, this mean’t that Nadine was packed to capacity but it still zippered closed no problem , with a double zip to help me out. It also mean’t that it now was quiet heavy and I wouldn’t recommend carrying this lot on a shoot, but for the proposes of my trip and having everything contained it was excellent. 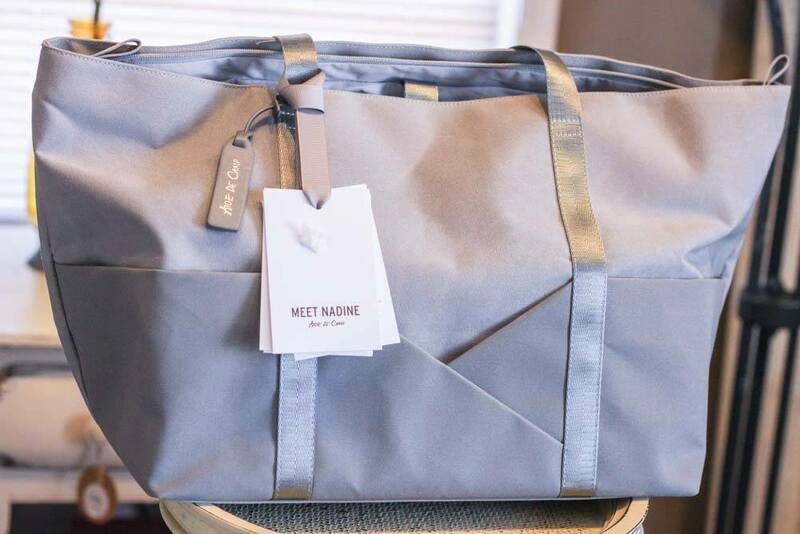 If I had have been hopping on a jet, Nadine even has a little trolley sleeve in the back to slip over your luggage handles to make it easy to navigate the airport. 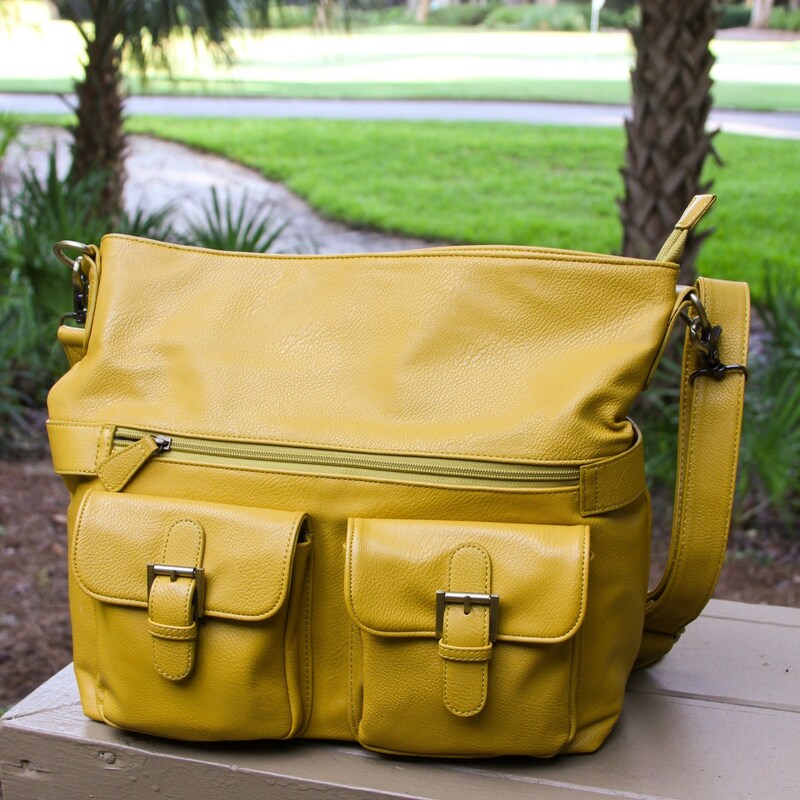 Perfect for weekend getaways. So lets take a closer look at this beauty! 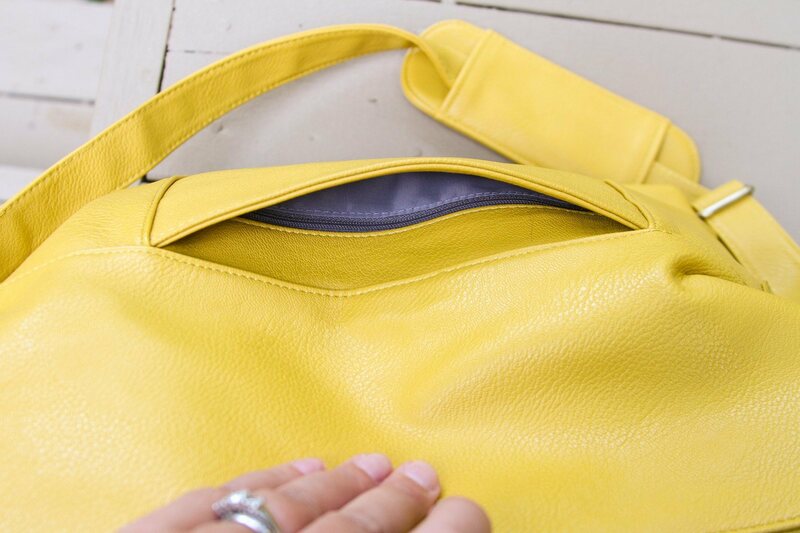 The Nadine is positioned as Aide De Camp’s Weekender bag so your getting a lot more bag than something which will only fit your DSLR. First off, she arrived beautifully packaged within her own dust bag and in a gorgeous black box. No danger of it getting damaged in transit. Unlike my previous camera bags, Nadine is made from a wonderful lightweight but durable premium canvas material. I can’t stress enough how important this is as camera gear can get really heavy. It’s also water resistant. I have the beautiful slate color which is a delicate grey, but she’s also available in cream and charcoal. I was a bit worried that it might show the dirt but so far so good and I think a quick rub with a dampened sponge would clean up any messes. Two long shoulder straps means that it easily carried and I found that it sat really well on my body. 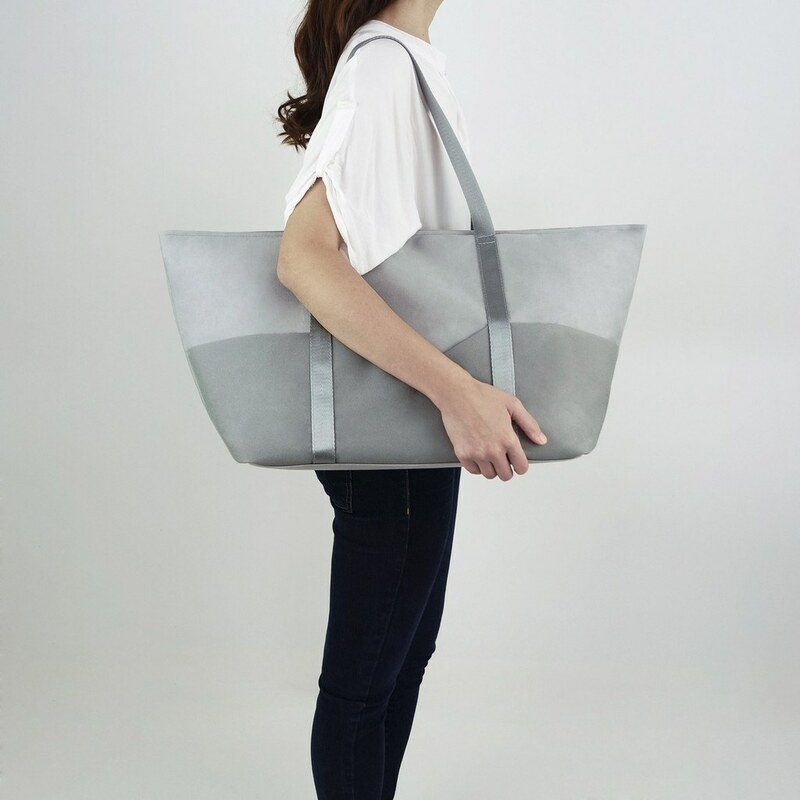 Because its so light weight, I would have no problem using this as an everyday bag – I love its “oversizeness” and I’m known for carrying everything but the kitchen sink in my purses! If you are a mommy with kiddos still in diapers you will absolutely adore Nadine. 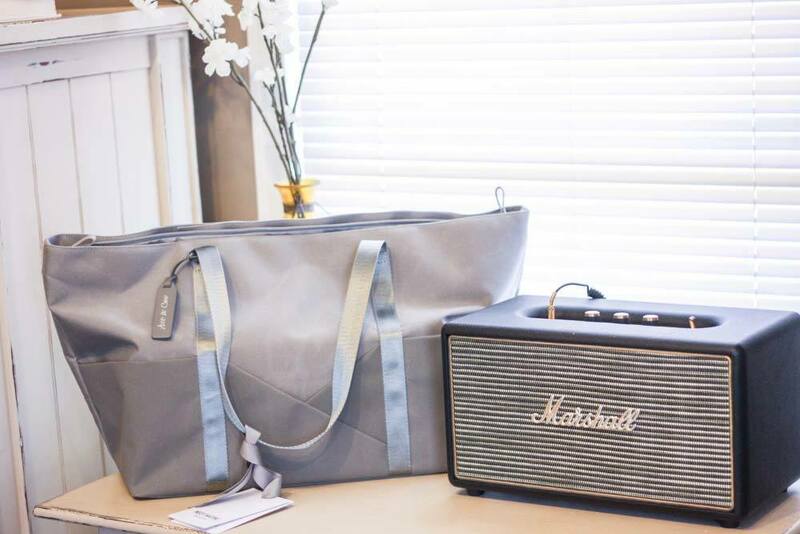 Not only does she have enough room to stash a few diapers and wipes and a spare change of clothes for your littles, the laptop protection sleeve can double as a diaper changing mat. Totally ingenious! 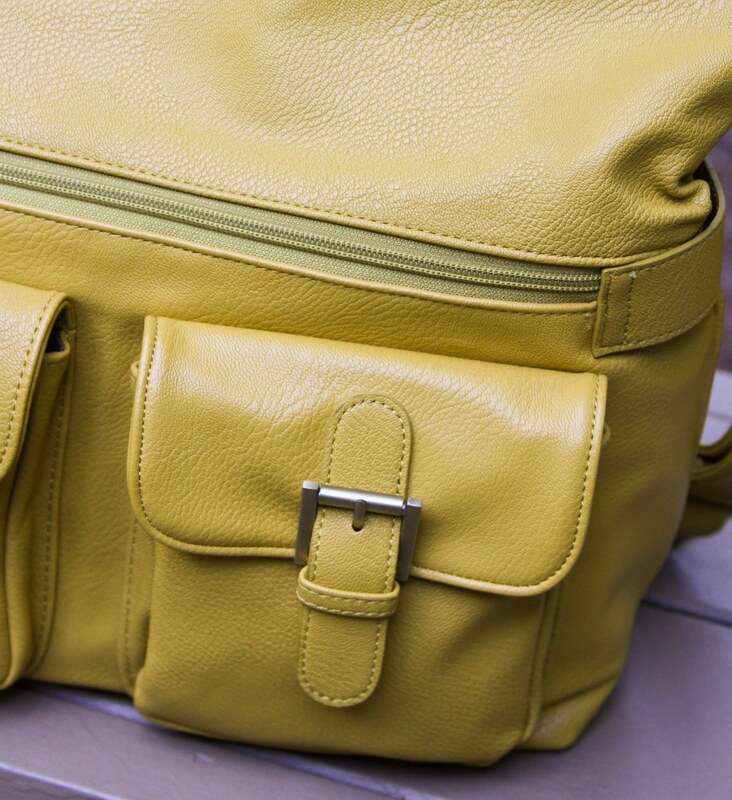 As you can see from my photos this bag really packs a hell of a punch in both functionality and style – both of which are extremely important to us ladies! 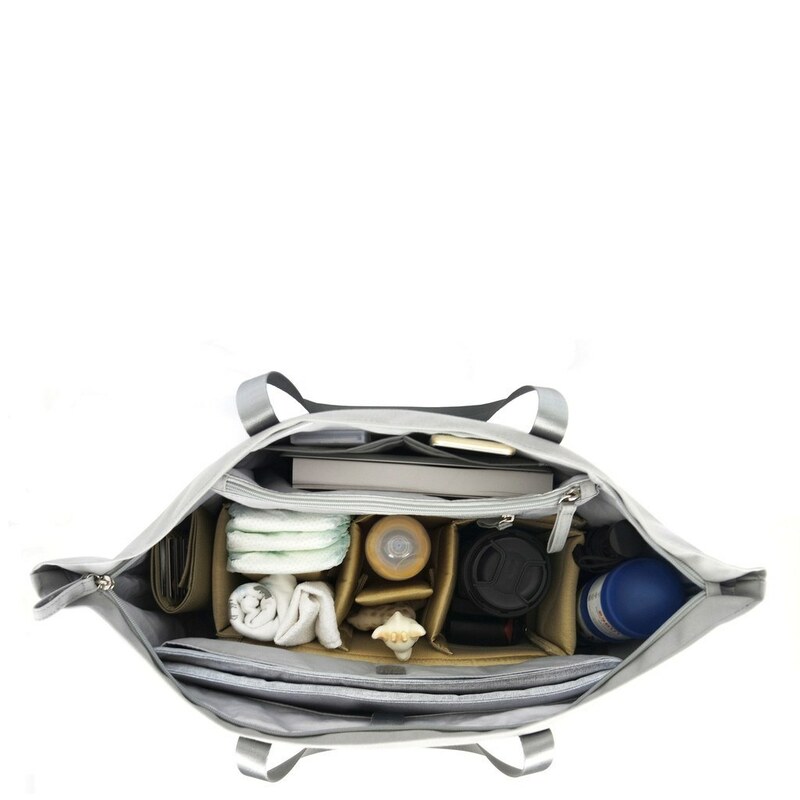 You can check out the Nadine bag here at Aide de Camp or order from B & H Photo here. Recently I spent some time in Florida with my family from Ireland and I had the pleasure of using my Dad’s Canon Powershot S95 compact camera. Although this is now an “older” Point and shoot camera I was so impressed with it I thought I’d do a little review on it. afterall, is it really necessary to buy the absolute latest model of camera since the manufacturers change them every six months or so. Watch the video below and let me know your thoughts on this. Hey there! This week I’m in sunny…or maybe not so sunny Florida, and I thought I’d take the chance to give you a little hands on review of a camera that my Dad actually brought with him. It’s called the Canon S95, it is a Powershot point and shoot camera. This camera has been around for a couple of years, so it has actually now been replaced by the S110 but I just thought I would give you a quick overview on this camera because I’m really excited to use it. It’s really nice and then we can do a comparison with the new camera and see what the differences are. So, the Powershot S95 is a very high spec compact camera. As you can see it’s really small – it fits pretty much on the palm of my hand. I’s a really good little camera for anybody who likes to take photos that are just a little bit more than what they can get with their phone. It is also really good for people who are used to using a digital SLR – if you like to use the manual exposure mode such as Aperture Priority, Shutter Priority and even Manual Exposure or even if you are just trying to experiment with your photography a little bit and you want to move a little bit outside of just point and shoot, this would be a great camera for you. The first thing that you notice on your camera is that it has a really big 3 inch LCD screen. This means that there is no viewfinder on the camera which can be a little bit off putting to some people. But because it so big and it so clear I find that it isn’t a problem to use. You have the mode dial up here just like the digital SLR and you have all the same sort of modes – the P, TV, AV and M and then of course you have a whole bunch of custom modes that you can set for specific types of photography and you can have good fun playing around with those. It also has a x3.8 optical zoom lens which is a little on the small side and I think that this is something that they really improved in the newer version of this camera – I think they have got up to 5X optical zoom now which is better. But considering that it has such a compact little body, it is pretty impressive to have the wide angle plus a bit of a zoom there too. So the one thing that I really love about this little S95 camera is that it really feels nice to use it in your hand. It has a little nice coating at the back that gives a little bit of a grip and it has this little ring that can be fully customized to whatever you want it to be. For example now I have to set to control the ISO because I have been shooting a lot in low light here and we have been using this camera with no flash, so I wanted to push the ISO up and play around with it rather than have to go in and play around the menu. You could also set this dial to control exposure compensation,the one that we talked about in my last video. You can have it set to focus, white balance and if you like that feeling of zooming your digital SLR, this is quite similar to that by using this custom ring function here right at the top. S95 also has a really good movie mode, and it will capture 720p movie in high definition and it is really more than you need if you are just going to watch it on your computer or making your little imovies so it is really – a nice feature to have in a camera. It’s all in one so you don’t have to worry about taking another device with you. One of the awesome features with this camera if you are used to using a digital SLR is this camera can actually shoot in raw and not just in Jpeg which means that you have full control over all of your exposure settings and your white balance. And if your are used to using your digital SLR shooting in raw then this is a nice compliment to that. I didn’t want to take by big camera down to the beach with me because you know sand gets everywhere so we just pop this little camera into a ziplock bag and you can take it out and play with it on the beach – and I still have the full editing capability use with this little compact camera. The main difference between this particular camera and newer models seems to be that they have increased the zoom to 5x optical zoom which is nice and they have changed this LCD screen at the back to a touch screen. Now, I have to be honest I’m not a huge fan of the touchscreen LCD screen because you tend to get finger prints all over it. But you know now with iphones and ipads we are kind of already used to using a touch screen. So it is just a matter of wiping off. They have also included a wireless technology so you can transfer your photos directly from your camera to your printer-if you have a wireless printer. It also has the new Canon HDS technology which means that is very good for shooting in low light which I already found that this is great for shooting in low light. So, I can only imagine the S110 is even better for that. So all in all I would have to say is that I really love this camera and I’m kind of envious that my dad has it. I might consider getting one the S110’s for just everyday shooting and when I don’t like to carry the DSLR around with me all the time, this would be something that I think would really compliment my kit, and you know there are always times when you just don’t want to bring your DSLR. I will also recommend this for somebody who is interested in getting into photography but just don’t want the full expense of a digital SLR. These cameras are the high end of the compact camera range and think it is around $379 which definitely isn’t cheap but it something that it would be worthwhile as an investment – just to see if you get a feel for manual photography and to be able to control your exposure and play around with some of the settings. If you have the Canon Powershot S95 or any of the later versions, I would love to hearwhat you have to say about it in the comments below! There comes a time for every photographer when you know the basics, you’re familiar with your camera and you are ready to move to the next step. When this happens you can sometimes get stuck. Stuck not knowing where to go next with your photography. Have you reached this point where you need another approach to pursue your visual creative process? Have you thought about what your usual creative process is? – Is it intentional or intuitive? Do you know where your photography aspirations are leading you? Have you though which path would you like to take -Portrait or Food Photography, Landscape or Photojournalism? Or do you just need to get unstuck? PHOTOGRAPH is a digital quarterly magazine for Creative Photographers from the folks over at Craft and Vision and it will allow you to experience different paths in the magical world of photography. In this issue (number 3), you will be given access to the portfolios of renowned photographers; the likes of Henki Coentjoro and his black and white photography , Dave Delnea’s works from Tunisia and the stunning food photography of commercial photographer Kevin Clark. Also featured in the issue are articles from David Duchemin, John Paul Caponigro, Martin Bailey, Chris Orwig, Younes Bounhar, Jay Goodrich, Piet Van Den Eynde, Nicole S. Young and Al Smith. This introduction to these amazing artists is sure to inspire even the most stuck and creatively challenged photographer. When you flip through the beautiful pages filled with amazing images you will also learn each photographer’s visual sense, style and their influences unfolded in the question and answer section. You will see that they didn’t start out amazingly creating the images that you see now. Each have their own story to tell but they all have one thing in common- to always bring the camera with them wherever they go. PHOTOGRAPH will help you reflect on your own visual creative process experience. The featured photographers’ beautiful works will let you see the world from a different perspective. It will inspire and will motivate you to go out and shoot on your own terms and hopefully bring you closer to creating your own style of photography. Go out and shoot! See the world in different colors and angles! Capture priceless moments. And most importantly DON’T forget to grab a copy of this issue for only $8. Remember that even though you may have your own creative vision we all need inspiration from others and a subscription to the ad free PHOTOGRAPH will take care of this for you every 3 months. Right now you can get a one year subscription to PHOTOGRAPH for only $24, saving you $8 and guaranteeing inspiration for the year ahead. Studying these expert photographers is truly a wonderful way to bring your photography to the next level. don’t miss out! lights, and you just wished that you could share that feeling of awe of the picturesque view unfolding right before your eyes? So you take a snapshot of that glorious view because your camera is always with you right? But somehow the photo did not translate what you saw right in that very moment. It’s just kind of, well, blegh…You thought you captured all the elements involved in making a beautiful photograph, but it just wasn’t right. So where did you go wrong? Most likely you didn’t really do anything wrong. It’s just difficult to represent breathtaking events that transcend time such as the movements of the clouds, sunny to cloudy day, beautiful sunrise or sunset, lovely gray city fog to luminous sparkling city lights, accurately in a single image. TIMELAPSE an introduction to still photographs in motion by Dave Delnea is an ebook created with all the information, tips and techniques to capture and shoot a Time-Lapse sequence. Time-lapse photography is simply a record of time unfolding in a well-composed, still frame. If you want to learn how to do it, this book will guide you in learning both Still and Time-Lapse Photography that can be great ways for communicating tales of travel and adventures to the world. This ebook will also let you take a peek of Delnea’s beautifully crafted photos over years of travels in which he learned and experimented with time-lapse photographs. The author breaks down the Time-lapse photography process into 4 very easy steps. He clearly outlines the essential equipment that you will need for time lapse photography, most of which are things that you probably already have in your own kit. 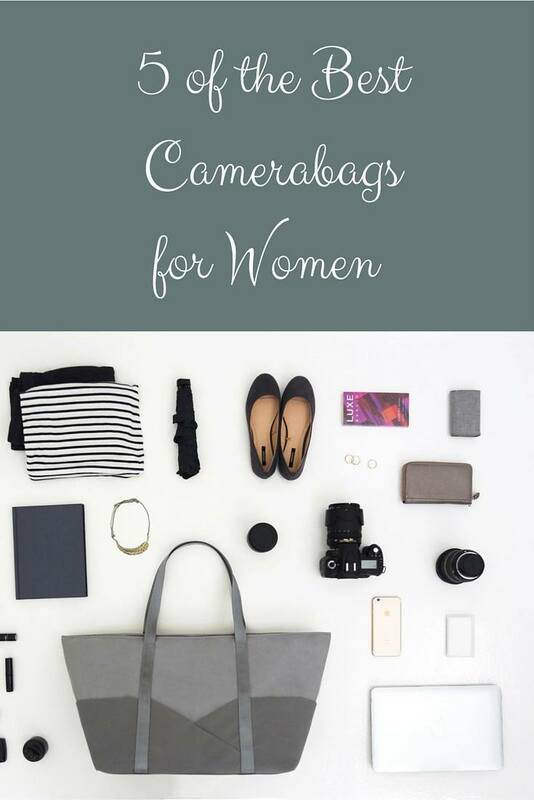 He also lists the essential extras needed to capture your very own beautiful time-lapse, but again these are things that you will probably come across everyday. He also adds the not-so-essential extras like the apps that he used in assisting to capture the images . Framing, Focus and Exposure considerations tips, Exposure & Mechanical Flicker, Post- Production Workflow using Adobe Lightroom and Hosting the image sequence in a video file are also outlined in a manner that is easy to understand even for a beginner photographer. If you purchase you’ll even get a link to Dave’s Lightroom Time-Lapse Preset which is pretty slick.The screenshots of the menu settings that he used are also shown which will help you walk through the settings suited for each situation to capture a time lapse. The author’s style is light hearted and free spirited with a dust of occasional humour which makes this ebook not only a fun read, but an educational resource to be kept and referred back to again in the future. You can purchase TimeLapse by Dave Delnea here from Craft and Vision and use the coupon code TIME4 to get it for only $4 until March 22nd at 11.59pm PST Or if you decide to purchase at least 4 other Craft and Vision ebooks in addition to Timelapse , use the code TIME 20 you’ll get 20% off your entire order. P.S Watch a Sample of Dave’s TimeLapse photography here. Holidays are coming… Holidays are coming…. Yes folks it is absolutely that time of year again when you have to think about turkeys, presents, fitting into that cocktail dress and Holiday Cards. Every year I put off prepping mine to the last minute so this year I’m feeling super ahead of the game as I already have my prints chosen and uploaded to Tiny Prints. My big dilemma now is trying to figure out which template to choose from as they have SO MANY. If you are thinking about creating personalized holiday cards this year here are 5 tips to help you choose the right photos to include. 1. Think of the memorable events that happened this past year. Some will be obvious lke the birth of a new baby or in my family’s case my husband’s graduation (Yay!) but others are less so, like your daughter’s first ballet recital or your son’s first win at soccer. Thinking of these event will help you figure out what kind of photos you might want to include on your card and whether or not you want a muti-shot layout or something with fewer options. 2. Be traditional. You could of course decide to go down the traditional route and specifically set out to take or get taken a family portrait or some photos of the kids. If this is your style, think about how you can change it up a little from last year, varying the style of clothing from dressy to causal or the scene from formal to an everyday type of thing. Nobody wants to see the same set up as last year with just a change of clothes. 3. Look for close ups. If you decide to do several images on one template, choose images that are cropped fairly close up of your subect. This will add a more prfoessional look to your finished card. Tip: you don’t even have to get the whole face in! 4. Think candidly. Some of the cutest poses are those that aren’t . Posed that is. Pick fun photos that show your family’s personality to have a really stand out, memorable card. 5. Match the template to your photos. Try to coordinate the colors in the photos with the colors in your chosen template. This should be no problem if you use somewhere such as tiny prints as they have such a huge choice to choose from. This again will mean that your end product will look a lot more polished and finished and will stand out on your family and friends mantel this holiday season. P.S. If you have yet to try Tiny Prints now is a great time to log on and check them out. Use the coupon code FS2012 at checkout to get free shipping until the end of the year! Would a photo canvas brighten up your world? What do you do with all those photos you take? Do you carefully edit them and file them away on your hard drive? Perhaps you go to the local drugstore or use an online service and print out bazillions of 6″ x 4″s which then ultimately sit in several (perhaps well organized) shoeboxes. Are you a Facebook Fanatic and share everything with everyone? Me? I’m a print girl. Actually I’m not just a print girl. I’m a blow it up big and frame it type of girl. If it’s worth looking at, then you might as well make it big – right? I guess this comes from my background as a print lab owner. For years when I lived in Ireland I had the luxury of cheaper prints and discounted framing at my disposal. At home my walls were always adorned with beautiful 16″ x 20″ fully matted and framed images of my latest trip. These days, as you know, my subjects are just as beautiful but a little more challenging – my 1 and 3 year old. I take so many photos of these little ones but I rarely get around to enlarging, never mind framing these prints. Custom framing is not cheap and neither is making high quality prints – and I have got to be the world’s pickiest printer. So you can imagine how thrilled I was when I was approached by Canvas on Demand who offered me a complementary photo canvas in order to do an honest review of their site. Firstly, putting your photos onto canvas is like killing two birds with one stone – a beautiful enlarged photo print that doesn’t even need framing. Secondly, I absolutely love Canvas prints because they truly make your photos into pieces of artwork. I love the gallery wrapped look – the way the canvas is wrapped around the frame. It is really polished and helps to bring life to an otherwise two-dimensional piece. So I agreed to do this review only if it would be fair and honest (have I mentioned that I am picky?) so you can be assured that I put it to the test. Fist up I had to choose an image that I would like printed. I have an album of “for framing pics” so it was easy to choose the one I was going to print right away. I choose this shot of my 2 girls and my nephew that I shot this summer. Full frame images work really well for canvas printing, so crop your picture to eliminate any unnecessary background. Once I’ve cropped my image to get it the way I’d like it to look, I do any other necessary editing such as blemish removal and exposure adjustments in Photoshop Elements and then save it to my desktop so that I know where it is when I need to upload it. Then it’s over to the Canvas on Demand website. The site is clearly laid out and really easy to use. You can see from my video below how you will have your order placed in a matter of minutes. I decided to get a 16″ x 20″ Canvas with a 1 1/2″ wrap and a black edge and I am super thrilled with the results. You can see from the close up detail that it is expertly finished and the reproduction of the colors is spot on. This was my one big concern because like I said before – I am picky about my colors, but they were exactly as they were supposed to be. So, if you think you’d like to give Canvas on Demand a whirl, tell ’em I sent ya and get 20% off your first order by using this link. Let me know how you get on – I’d love to hear your experiences. Disclosure: I did receive a 16″x20″ Canvas Print so that I could adequately review this website’s product quality and service. If it hadn’t have been up to scratch you can be sure I would let you guys know. When I was back home in Ireland last month I was lucky enough to get my hands on the new Nikon Coolpix P510. This is a Bridge Camera (not quite a DSLR but bigger than a point and shoot) with a powerful zoom lens. Click on the video below to here my thoughts on this camera and check out the photos below to give you an idea of the strength of the Optical Zoom lens. Thanks to my Auntie Jean and Uncle Pete for providing the beautiful garden for my test 🙂 . PS You can check out more reviews of the P510 on Amazon. The following is a guest post from Simon from ViewBug – A very useful article for those of you looking for a good travel camera. Enjoy! With the arrival of summer, so comes sunny days, outdoor adventures and vacations. Plenty of you are faced with the challenge of picking out a new camera to capture it all. 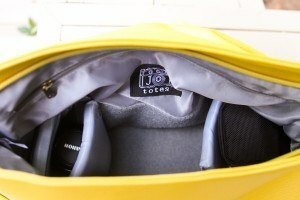 With the amateur photographer in mind, I’ve picked out a three top cameras, each in its own category, all perfect for travel. This camera is the very latest in Panasonic’s line of “travel zoom” cameras. If you haven’t heard that term, it was coined by Panasonic with its first Lumix DMC in 2006, as describes a compact point-and-shoot with a more powerful lens and zoom. This new category caters to the travel photographer, who needs the portability of a point-and-shoot, but wants the flexibility of a stronger zoom to capture their shots. The main attraction is it packs in a 24mm ultra-wide angle 20x zoom lens into its only 1 inch thick body. This means that you can have an impressive zoom that’s portable enough to stuff in your pocket, making it a very accommodating travel companion. The lens is equipped with Panasonic’s Power O.I.S. optical image stabilization, which is a big help when taking photos at a high zoom level without a tripod. It can take photos up to 14MP and can even record video up to full 1080p HD. On top of these strong main elements, it comes with a wide range of high-tech features, controlled with its 3-inch touch screen. It includes automatic, manual, semi-manual shooting modes, with a whopping 17 scene modes. Highlights include a panorama shot mode, multi-exposure HDR mode and night shot mode. To top it off, the high-speed of this camera also allows for 3D photos to view on any 3D-enabled device. While retailing for $350, it can be found online for around $260. For any amateur photographer more serious about their travel photography, but not wanting to step all the way up to the costs of a full DSLR, the Canon PowerShot SX40 HS is a fantastic alternative. Not only priced more for the beginner, it is also designed for one, thanks to a great image stabilization and range of automatic shooting modes. It is also smaller than a full DSLR, making it easier for a newbie to adjust to. The fitted lens has a ultra-wide and long 35x zoom lens and 12MP capability, with an upgraded CMOS image sensor and Digic 5 processor from the previous model. And it has you covered for HD video, with 1080p at 24fps. Along with the standard shooting modes, this PowerShot spices things up with creative modes like fish-eye, miniature effect, monochrome, toy camera and super vivid. The 2.7 inch viewfinder can also pop out and rotate for your convenience. And not only is it already cheaper than buying a DLSR and lens, it’s come down from its original price of $530 last October, to around $379 today. This camera marks Nikon’s first attempt at a rugged point-and-shoot, also making them the last among its major competitors. While late to the category, their first attempt with the Coolpix AW100 was a strong one. The solid design allows this camera to handle 5 foot drops, sink to 33 feet underwater and survive freezing 14F temperatures. It doesn’t slouch in the imaging department, with a 16MP CMOS sensor and full 1080p video capability. While zoom is limited due to its rugged design, it still fits in a 5x optical zoom with Nikkor Ed glass lens. Two cool travel-centric features included is GPS for geo-tagging and an e-compass. And it also comes in a few fun colors, from basic black to blue, orange and green camo. While the blue and camo look cool, they might be a bit easier to lose underwater or out in nature, so I’d personally go with the orange. This camera was first released with a $379 price tag last summer, but can now be picked up online for around $299. Simon is an amateur photographer and blogger for social photography website Viewbug.com that also specializes in photo contests.